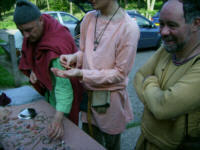 The Dark Ages Society (http://www.darkagessociety.co.uk/) is a small friendly society with several Wychwooders in. At the July 2007 Holmbury event there were 4 of us: Shelagh, Bunni, Dom and Other Emily. The Dark Ages Society run over half a dozen weekend events a year. Most of these are private events, although there is the occassional public show. This particular weekend event at Holmbury was pretty much the archetypal DAS weekend. Many more photos from the event are available here and here. DAS events tend to take place in small villages with nice village halls and nice pubs. Holmbury is a particularly nice location, with a wonderfully situated hall (200ms from the pub, 200ms from the fighting woods). Getting to these locations can be difficult, but people a normally more than happy to give lifts from stations. Shelagh & Al often give lifts to people from Woking if you ask nicely, which is very kind of them. People arrive at DAS events on Friday evening, in dribs and drabs. Fridays are informal affairs: people unpack all their stuff, choose their place in the hall to sleep, and head down to the nearest pub. In the pub people catch up with each other, argue which unit gets to have which new members, and drink lots. Then everyone heads back to the hall. A bit more drinking occurs, then people go to sleep. Sleeping at DAS events is not a particularly restful experience, and people snore. LOTS. You are advised to bring earplugs or sleeping pills or enough booze that you can drink until you pass out. People wake up, hopefully not nursing too bad a hangover. Slowly they stumble around, drink coffee, and get into kit. Then Saturday daytime is devoted to fighting. This is Fun. Of course, non-coms are also welcome! The day's fighting begins with training. This gets everyone ready and back into the swing of things, and is also when new members are taught how to fight. Often Wychwooders can be trained up to safe levels in one training session. DAS fights almost exclusively with spears. People (men or women) wearing male kit fight with single-handed spear and shield, a technique that is particularly effective in shieldwalls and that many period illustrations show (although DAS uses under-arm spear rather than the more authentic but much more dangerous over-arm spear). If you want to try this before attending a DAS event, at battle practice you can chat to one of the people who've been to DAS before. Women wearing female kit fight with double-handed spear, and tend to guard the flanks of shieldwalls. Lots of people in Wychwood can show you how to fight like this. Obviously we're not official DAS training officers, so make sure you listen to what the actual DAS people say. They've been doing it a lot longer & are a lot better than us! After the training comes the actual fighting. 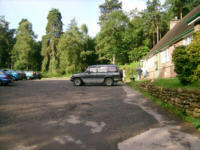 At Holmbury the fight site is a short walk up a hill, in other DAS events this often involves a car journey. Once everyone is gathered at the fight site the scenario is explained. These may or may not be based on historical events. 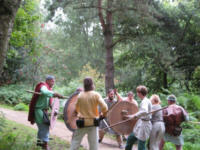 At Holmbury a (slightly overly complicated) attempt was made to re-enact the entirity of the viking wars. After each fight the winning side would claim a piece of ground off the loosers, and at the end of the day these wins and losses were all plotted on a map of Britain. Whatever the scenario, the events of the day are typically similar. People split into their units, and wander around woods looking for other units. If two units find each other, a tense negotiation might take place, possibly followed by a fight. DAS units typically fight in groups from single individuals to almost a dozen people. Generally speaking big units tend not to commit all their numbers to a fight against a small unit, and sometimes big units will split into two arms. Units also occassionally ally with other units. The unit is a key element of DAS organisation. Everyone is in a unit, and sticks with that unit throughout the weekend. Units fight together and feast together. New members can try several units over several events before deciding on one to stick with. There are currently three Saxon units: the Sumorsaete (the biggest Saxon unit, Bunni's current unit), Beorcshiringas (which Dom is in & is looking for more recruits for) and Chiltensaete. There are also three Viking units: the Holmbyggja (Shelagh's unit), Westmen and Oestvikinga (the smallest, which Bunni will join soon and that Chris is currently in). Everyone also has an authentic name and character, and can write histories to explain why they're a member of their unit. The fighting is interrupted by an early-afternoon lunch. Typically involving lots of bread and cheese. Fighting normally resumes after lunch- sometime this fighting is a continuation of the scenario (it was at Holmbury) but sometimes it is something else, like a boar hunt. After the second fight people return to the hall, and relax. People help prepare the evening feast, lay the table, make kit or do crafts, or buy things from the DAS members that are selling. At Holmbury Ceolred Monger Thane of the Beorcshiringas had a selection of bling, little authentic things (snips, money, shield bosses, etc) and material to sell. Wulfstan Thane of the Sumorsaete had a few spearheads to sell, and Ingibjorg of the Hólmbyggjar had the DAS spearshafts. As the afternoon draws on, people get changed out of their fighting kit and into their feasting kit (if they have any). 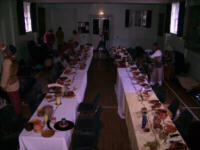 The hall is prepared the feast, and everyone lays out their bowls and mugs and whatever other equipment they need. They then go down the pub for an hour or two. This gives the unit hosting the event the chance to finish the cooking and the last preparations of their hall. In the pub mighty tales of battles are told, and everyone relaxes and unwinds. And quaffs. At Holmbury this year there was an extra event in the evening. Bossi, ex-styrsman of the Svart-svín and current leader of the Hólmbyggjar, was getting married in character to Halla. This was a beautiful simple little ceremony carried out by Styrkar of the Westmen. DAS takes it's feasting very seriously. At least in the first part of the evening, before people get too drunk. Everyone trys to keep in character, and sticks in their units. If you're new, the best idea is to sit down and just enjoy the show, don't do anything unless your unit leader tells you to. Also, stay authentic in the hall. Keep bottles of booze off the table, don't use phones or cameras, that sort of thing. The hall is really nice when it's as authentic as possible. Each DAS event is organised by one unit. The hall is assumed to belong to this unit, everyone else is a guest. Eventually no-one can eat any more, and the evening breaks up a bit. People don't sit in their units any more, they drift round. Board games or dice games might be played, tales of bravery or stupidity might be told. People can go to sleep whenever they feel like it (although it can be noisy- the snoring combined with the singing and tale-telling is not a particularly peaceful combination). Everyone wakes up, drinks lots of tea, maybe even eats bacon. The hall needs to be tidied and also games might be played (Kubb or ballgames), but eventually everyone slopes off home. None of these are needed. You definitely won't be able to use the other weapons (only members of 2 years standing are allowed to), and the armour is also regarded as a high-status item. In general it's only unit leaders who wear it. Leather armour or helmets are lower status so more accepted.